What piece of my gear should I improve immediately? Clients often ask me: What piece of gear should I improve on before all others? A good rod is essential, and a good line on a serviceable reel is important as well, but my answer may be surprising: get a better pair of waders. If you get an excellent, top-of-the-line pair of Gore-Tex breathable waders, you’ll be more comfortable wherever and whenever you fish, no matter the conditions (some of the absolute best trout fishing occurs in the gnarliest months, such as late October and early March); if you’re more comfortable in all conditions, you’ll go fishing more often; if you go fishing more often, you’ll get better quicker; and the better you get, the more you’ll enjoy yourself. How do get the best drift with a dry fly? A good pair of waders also allows the angler to wade boldly, and to better position himself or herself for a good cast and drift. 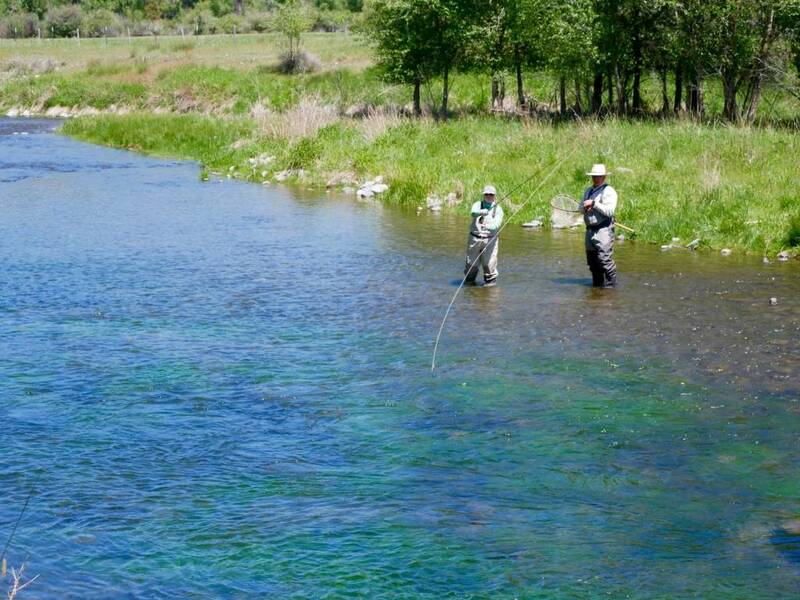 Much of what helps us attain a good drift with a dry fly, or a nymph for that matter, isn’t the distance or even the accuracy of the cast, but rather, its angle in relation to the river’s currents. Time and time again while wade-guiding on the waters in Yellowstone National Park, I’ve watched very competent casters (but lazy waders) put themselves in poor position (with too many conflicting currents between themselves and the fly) and thus achieve dragging drifts. The angler willing to wade a bit farther will nearly always put herself in less-frequently-fished water, in better position to cast, manage line, and set the hook. Why is my backcast so important? As Norman Maclean wrote decades ago, “Until man is redeemed, he will always take the rod too far back on his backcast.” Much has changed in the fishing world since Maclean wrote – we have blogs, online fly shops, chat rooms and hatch reports these days – but Maclean’s statement still holds true. The backcast is much like a back swing in the world of golf: No matter how good your forward swing, you can’t overcome a bad back swing. Taking the rod too far back on the backcast causes myriad problems: It throws the line into the water behind the angler instead of into the air, impeding the forward cast; it opens the casting loop, decreasing accuracy; and it just plain looks bad. What’s the number one casting mistake and how do I solve it? While guiding, I use many analogies to help beginning casters grasp this concept. I might say, for instance: Pretend you are in a phone booth, and you are trying to hammer your way out of both sides of the booth. Or perhaps: Pretend you have stuck a potato on a fork, and you are trying to flick the potato at someone behind you, then, with the fork reloaded, flick a second potato at someone you’re facing. You’ll notice that both of these imaginary actions force the angler to concentrate on stopping, and more precisely, an acceleration to a stop. In the cast itself, the acceleration serves to generate line speed, which is essential to powering line, leader and tippet through the inevitable wind. Why did my line pile in front of me? If you’re wondering why your line lands in a pile out in front of you instead of shooting out like a laser, it’s probably because you’re taking your backcast too far back. In Maclean’s days, when most anglers fished with slower bamboo rods, the adage “make the cast between 10 and 2” was adhered to, meaning that if high noon were indicated by the rod held straight up, directly overhead, then the backcast stopped at 10 o’clock, and the forward cast stopped at 2. These days, however, with the advent of faster graphite rods, the cast can more accurately be said to occur between 11 and 1 o’clock. How do I beat this wind? Another reason the line might be landing in a pile at your feet is because the wind is blowing in your face. Wind is a relative term. The same expert who easily throws a 100-foot cast into a 40-mile Bahamian headwind at a tailing bonefish will have trouble punching a 15-foot leader tapered to 7x on a spring creek while tossing a 3-weight to rising cutthroat on DePuy’s Spring Creek. To a beginning caster, a 5 mile-per-hour breeze might thwart the cast; whereas an experienced caster can put a fly on a pie plate at 75 feet despite a 30-mile-per-hour easterly blowing straight up Paradise Valley. The difference: line speed and size of casting loop. The more line speed one can generate (think: condense the casting motion, use more energy in a smaller space), the tighter one can keep the casting loop, and the tighter the loop, the more readily the line cuts through wind. What is a reach cast? Line speed and tight casting loops also allow anglers to more easily make casts that are essential to good fly presentation, such as the roll cast (for use in tight situations), side-arm cast (which helps cut through wind), and the all-important reach cast. Because it allows the angler to place the fly downstream from the fly line and ensures the fly itself floats drag free, the reach cast is the most important arrow in the trout angler’s quiver. A standard cast coupled with an upstream mend will fool trout fairly consistently, but the reach cast (often called a reach mend) is needed if the angler wishes to regularly fool large selective trout, especially on spring creeks and great hatch rivers such as the Bitterroot, where long downstream drifts with light tippets are paramount.